Worn runes on ancient ruins, scrawled annotations on old maps, scribbles in the margins of arcane tomes – cryptic text is a central part of the adventuring experience. Basic encryption schemes are an excellent way to embellish your campaign with a consistent textual theme while allowing for the inclusion of messages hidden in plain sight. 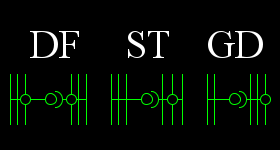 This post describes a simple connected cipher, named Crypt, perfect for arcane languages and alien text. 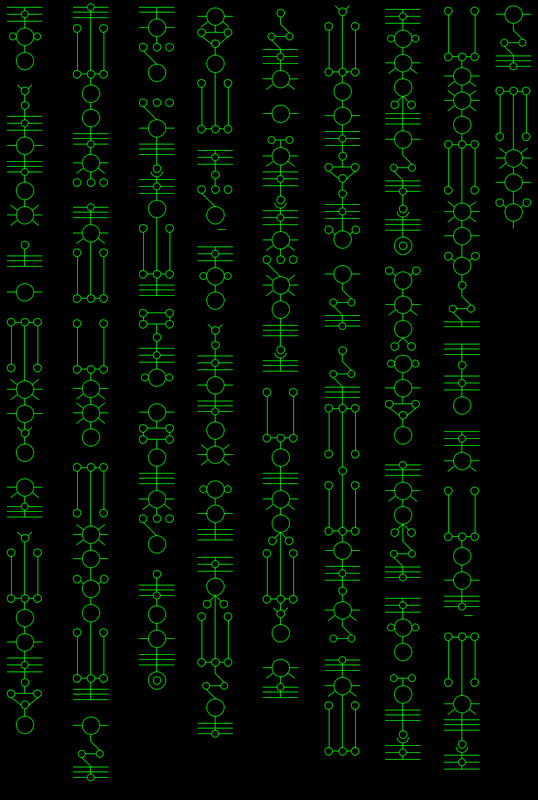 Crypt is a cipher text inspired by necron glyphs from Warhamer 40k. It is a simple substitution cipher, meaning it is easy to use and can be easily adapted to any alphabetic language (ie, doesn’t have to be English). Transcription is easy - just take each letter from your text and convert it to the appropriate character. Link letters together into words along (mostly) the central axis. Need Moar: Not all characters have a Crypt symbol. I welcome suggestions! We could use a sweet number scheme and some more punctuation (?!). I have used cryptic texts in my games to provide flavor and hide information for the players to discover. One great aspect of this is that it can be nuanced – players may not realize until halfway through a campaign that all of the maps contain annotations in the same language that they can decipher – and they can do the solving offline. Solving the cipher is often fun and rewarding. A very simple Java program to generate similar images is available here. Feel free to develop improvements. This is amazing. It could easily be made into a font file, so that people could type with it in OpenOffice or the like. I loved the attention to detail for the combination letters, and find the entire script to be beautiful. My only quibble is the name! I was under the assumption that this was a pre-existing font that you were just re-appropriating for RPGs. This font needs a more descriptive name, something that evokes the feel of it. Also, you should definitely share this on a font or art site, so that others can find it. Also, I've noticed that you use very nice graphics for your submissions. What are you using to generate them? I agree - the name is atrocious. I couldn't come up with anything at the time. The Riven numbers and non-base 10 ideas are excellent. Nesting polyhedral shapes would look very geometrically neat and would clearly indicate numbers. I will try it out! The current graphics were made with code I wrote in Java (see link at base of sub). I haven't worked with Java in ages, but started writing it up in Julia, along with the Knuth-Plass line-breaking algorithm, which should make it really neatly spaced. I've never worked with font files, but the idea is intriguing. If one can add in the extra logic, like the connecting lines between letters and the special separating character, then it should all be possible. http://mediamilitia.com/taking-type-to-the-next-level-with-alternate-characters/ -- alternate characters would be useful for DF, ST, GD, and this article does a good job explaining what they are and how they work. There are several free font editors out there -- both downloadable and entirely online -- that will allow you to create and edit font files, though I'm not sure which ones will support the extra features you'd need. I'm just glad this sub exists, because I have no patience personally to attempt something like this, yet tremendously appreciate having it handy, for my use (and abuse). This is amazing, and I will need to check out that code too! This really comes from an ancient Chinese novel. Imagine during the PCs' travels, they come to a place where the gender roles are completely reversed. What adventures will the PCs encounter in such a place?